Get the Pro pack for only $1. Limited time Celebrate the launch of the new Unixstickers powered by Sticker Mule. 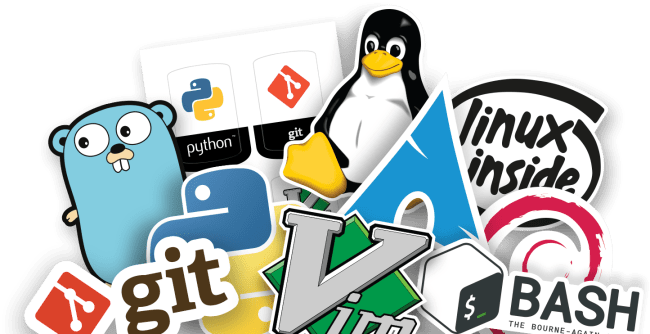 $1 $9 10 stickers Badge sticker sheet (Arch Linux + Git + Vim + Python), Vim, Git, Python, Official Bash, Linux Tux, Debian, Arch Linux, Linux Inside, GoLang. $19 20 stickers Pro pack + badge sticker sheet (Debian, Linux Tux, GNU Linux, Little Tux), Copyleft, Don’t Drink and Root, GNU, Emacs, C++, Open Source, Jenkins, 127.0.0.1, Docker. $24 30 stickers Elite pack + badge sticker sheet (Linux Inside, Free BSD, Fedora, Linux Mint), Fedora, Ubuntu, Ruby, Ruby on Rails, Fork Bomb, Have You Tried Turning It OFF/ON Again?, React JS, CSS3, HTML5. Powered by Sticker Mule, Unixstickers is the largest collection of Unix, Linux, software and programming stickers. Collect all of them and cover your laptop and other belongings with greatness. Want to make your own stickers? Sticker Mule helps thousands of people, startups, bloggers, artists and companies order awesome stickers that are printed beautifully and ship fast.